Close SPFLite with last tab ? Display File Manager Help ? Highlight Recent / Active dates? If this box is checked, then an END command on the last open Edit/Browse tab will terminate SPFLite.. If not selected, then following the close of the last active Edit/Browse tab, you will be switched to the File Manager Tab. Note also that if you right-click any file tab or File Manager tab, it is treated exactly the same as if an END command were issued for that file or for the File Manager. If this box is checked, then each Delete or Purge action selected for a file will result in a confirmation prompt before the file is actually processed. Files are deleted with the D line command and the CANCEL DELETE primary command; and are purged with the U line command and the CANCEL PURGE primary command. The confirmation will tell you whether the file will be Recycled or will be Purged (permanently deleted) depending on the Recycle option you have set, and gives you a chance to change your mind by clicking No. If not selected, the Delete or Purge will proceed without this prompt. Because this helps you avoid deleting files by mistake, you are encouraged to enable this option. If this box is checked, when the File Manager is activated it will display a Help legend at the bottom of the screen, showing File Manager line command codes and other information. Once you have used File Manager for a while and can remember these codes, the Help display lines can be removed to reclaim some screen space for displaying more file names, by unchecking this box. Highlight Recent / Active dates ? RED The file has been modified since the beginning of this SPFLite session. YELLOW Modified between one hour before the start of this SPFLite session and the session start..
GREEN Modified between eight hours before the start of this SPFLite session and one hour before the session start. BLUE Modified between twenty-four hours before the start of this SPFLite session and eight hours before the session start. This column will contain the file extension as a separate column. Only the first 8 characters of an extension will be displayed if the extension is longer. The extension will still be displayed normally as part of the normal filename display. The Profile for the file type is set to STATE ON. The file actually has a valid STATE file created. This column will have the last modified date of the file in the format. e.g. YYYY-MM-DD. This column will have the last modified date of the file in the format. e.g. YYYY-MM-DD HH:MM. This column will have the size of the file in abbreviated Byte format. e.g. 789, 12.3K, 123.4M etc. This column will have the size of the file in detailed Byte format. e.g. 9,999,999,999. This column is available for you to record small notes, memos, etc. related to the file. It will be a scrollable window, the maximum size of the note is 255 characters. The selected columns will appear to the right of the filename column, in the order you specify them. The filename column width will be adjusted to use the remaining width of the screen after allocating your requested columns. When using the FF (Find in Files) command in File Manager, there are certain file types you probably do not wish to search, such EXE and DLL files, and other binary file types. If you specify their file extensions here, the FF command will not search files of these types; that will speed up the search process, and will prevent SPFLite from trying to create default profiles for file types you never edit. The list is also used by SPFLite if you select the "Warn on Open of Non-Text files? item in Options => General. Because file types you do not want searched by FF are most likely binary files, they are the same kinds of files that you would not want to be modified by a NUMBER or RENUM sequence numbering command. For that reason, the sequence numbering commands consider any non-text file type you list here as being "exempt" from being numbered or renumbered. This setting specifies the maximum number of files to be retained in the Recent Files and Recent Paths file lists. The lists will automatically retain this number of entries, and remove older, less used entries from the list. The maximum value you can use is 99. 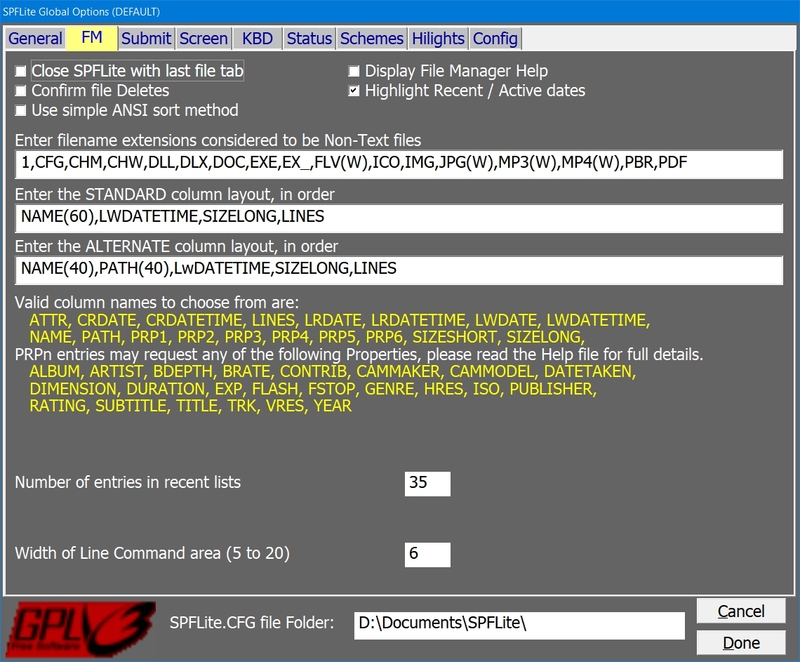 This setting allows you to choose one of two Directories to use as the Default when SPFLite attempts to Open or Save a file. Working Dir - SPFLite will use the current working directory at the time it is started. If you start SPFLite from the command line, that is what the working directory is. If you start SPFLite from an icon on the Windows desktop, there is a Start Directory you can set in the icon's Properties window; the Start Directory is the SPFLite Working Dir. Last Used Dir - SPFLite will use the last directory where it Opened or Saved a file. If you often use longer FM line commands, you can widen this field, which defaults to a minimum length of 5. Regardless of the width set for this field, commands you enter will scroll as you type them, so you can still enter any command you need. If you utilize the Note support of File Manager, this setting allows you to specify how much space on the file manager screen should be allocated to the display of the Note field. This does not restrict the size of the note itself, the Note field will scroll to allow viewing/editing of the data.